The REMEB project has led to the successful development of an MBR made from recycled ceramics based on waste from several agro-industrial processes. A three-year EU-funded project to develop and validate a membrane bioreactor (MBR) made with low-cost recycled ceramic membranes for wastewater treatment, will conclude on 31 August, having successfully achieved what it set out to do. The REMEB project, which began in 2015, has been funded by the EU’s research and innovation programme, Horizon 2020, which specialises in areas related to the environment through the promotion of the reuse of wastewater and the development of new, sustainable products. Current ceramic membranes are made from pure ceramic oxides (such as alumina, zirconia or titania), which are expensive due to the cost of raw materials and the complex manufacturing process. The project has led to the successful development of an advanced sustainable wastewater treatment system – an MBR made from recycled ceramics based on waste from several agro-industrial processes that will regenerate wastewater for agricultural use. The incorporation of waste in the composition of the membrane reduces the volume of waste and the price of this technology. The solution provided by REMEB uses waste such as olive stone, from the production of olive oil, chamotte, tile industry residue and marble dust. The area chosen for the MBR’s validation was Murcia, known as the orchard of Europe, and one of the regions with the greatest drought in Spain and a leader in the treatment and reuse of wastewater. The REMEB project consisted of an international consortium led by FACSA, a Spanish company specialising in integrated water management. 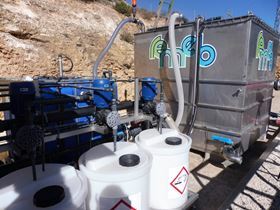 Accredited analyses of the water treated with the MBR REMEB system have determined that the quality of the effluent meets the requirements of current Spanish regulations regarding the reuse of treated wastewater. The REMEB technology could be implemented in municipal WWTPs throughout the world.